Coordinates Lat N 45:47':821" Lon W -91:17':560"
Site of Upper Chippewa Valley"s first sawmill; erected by Levi Felton and P. M. Parker in 1902. In winter all supplies and equipment were hauled overland a distance of 40 miles from the nearest Soo Line. In 1903 A.O. 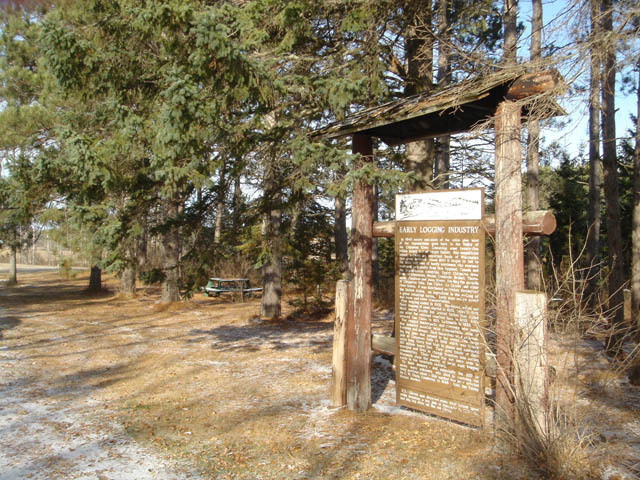 Nustad built the second sawmill at Eddy Creek one mile north on Reservation. 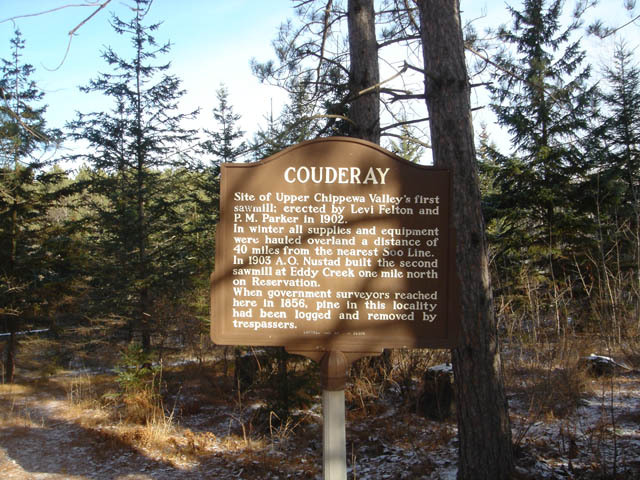 In 1840 nearly one-sixth of the white pine west of the Appalachians grew here in the Valley o the Chippewa River. 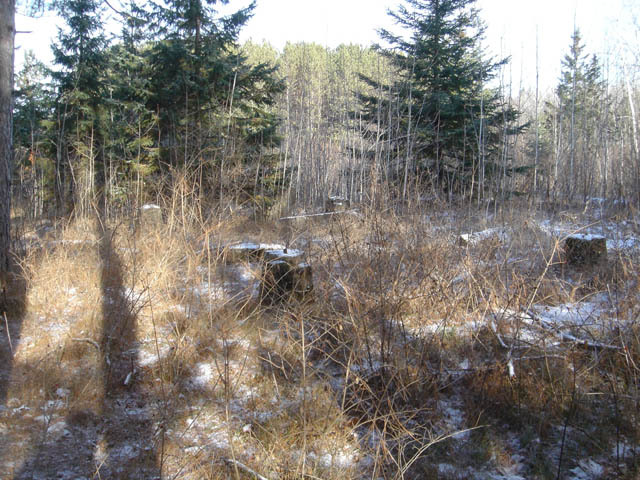 Containing some twenty-five billion board feet of virgin timber, this magnificent forest became an important basis of Wisconsin's first great industry. About 1840 it began to fall to: the axes and saws of hardy woodsmen who swarmed westward principally from New England. Canada an the Scandinavian countries. Upper Chippewa drew from its tributaries, Moose, Couderay, Brunet, Thorn-apple. Flambeau and Jump Rivers. Feeding the sawmill of Chippewa Falls. Eau Claire. La Crosse and other river towns, it was distributed as lumber throughout the United States, an ingredient in the making o a great industrial nation. Early days motive power was oxen and river transportation. Pine logging ended in 1905. Hardwood would not float: logging of same started in 1885. ended in 1945. Much sawed locally but several billion feet railed , out after the railroad reached here in 1903. Rails entered Eau Claire in 1871. Ladysmith in 1885. 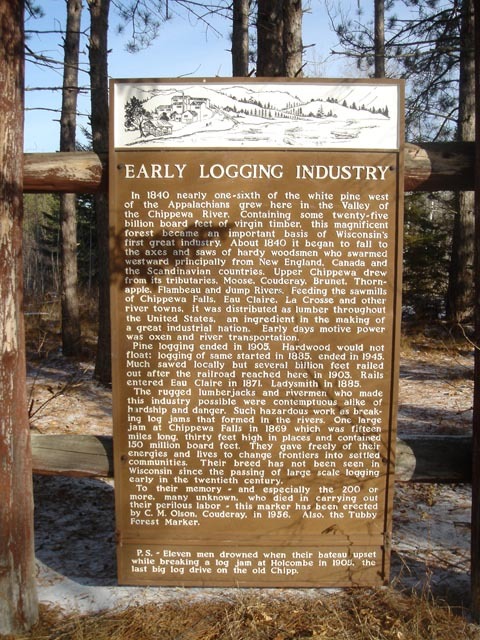 – The rugged lumberjacks and rivermen who made this industry possible were contemptuous alike of hardship and danger. Such hazardous work as breaking log jams that formed In the rivers. One large jam at Chippewa Falls in 1869 which was fifteen miles long, thirty feet high in places and contained 150 million board feet. They gave freely of their energies and lives to change frontiers into settled communities. Their breed has not been seen in Wisconsin since the passing of large scale logging early in the twentieth century. To their memory - and especially the 200 or more, many unknown, who died in carrying out their perilous labor - this marker has been erected by C. M. Olson, Couderay. in 1956. Also. the Tubby Forest Marker. P.S. - Eleven men drowned when their bateau upset while breaking a log jam at Holcombe in 1903. the last big log drive on the old Chipp.